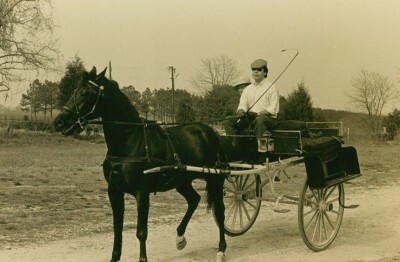 Jack Ferguson drives a one horse cart a looong time ago. In those pre-motor car episodes of Downton Abbey were you as spellbound as I to see the characters travel in horse drawn carriages? I was transported to a place where I imagined I just might be Elizabeth R (although I have always suspected that there is a good chance that some of my Irish ancestors might have been serfs). 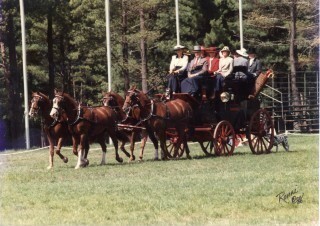 There is something so magical about riding in a horse drawn vehicle, especially in the Middleburg area where the sport of coaching is still a vital part of our country landscape.The vehicle might be pulled by a single, a pair, a four, or a unicorn (three horses with one in front and two behind).Those aboard embrace the delightful experience of travelling back in time. 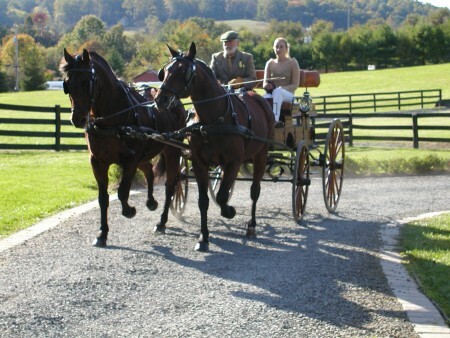 Whether one is riding on a carriage or watching it roll by on one of the Middleburg area’s rustic roads their presence in our community is one of the many things which makes life here so special. Some vehicles are actual antiques, others are reproductions and include coaches, roof seat brakes, landaus and so many more. I have not noticed too many of Cinderella’s pumpkin coaches in these parts although the amount of champagne consumed on some local coaching drives can cause various participants to swear that they have actually seen several horse drawn pumpkins with the Ugly Stepmother on the box (the place where the driver sits).They might also swear that they have seen 101 Dalmatians but that could stem from bubbly induced multiple vision upon viewing the actual one or two Dalmatians that are a requisite component of some drives. Hats for ladies and gentlemen who ride on a carriage are de rigeur which are sometimes paired with really large sunglasses (although never allowed in actual competition). They can be quite useful as a means of disguise for those aboard trying to hide the fact that they may have counted the most pumpkins. A driver on a carriage is called a whip and watching him/her turn around a large vehicle pulled by a four in hand is a very impressive sight. The key seems to be to convince all four steeds to go in the correct direction at the correct time.